A heady mix of fast, open woodland and lower visibility intricate contour detail, Glen Dye has been described as one of the best areas in Britain: Come and experience it for yourself! MOBILE PHONE COVERAGE IN THE GLEN DYE AREA IS VERY POOR/NON-EXISTENT. NEAREST RELIABLE SIGNAL AT STRACHAN BUT POSSIBLY NOT ALL NETWORKS. Event will be signed from B976/B974 junction in Strachan, near Banchory. If approaching from South on B974 the event is not signed till the forked junction that has a distinctive black and yellow AA phone box. Picture here. If approaching from West along B976 there is any earlier junction at Feughside in that can be used (in which case please be aware runners may be crossing) otherwise continue to Strachan and follow signs from there. Nearest public toilets in Bellfield Carpark on B974 in Banchory. Parking is along forest tracks. Exit is back along same track so we ask for everyone to arrive by 12pm and not to leave before 12.30pm to minimise grid lock. Maximum distance to assembly about 800m. Large vehicles and anyone needing to leave before 12.30 pm should use the roadside parking and walk up the track to assembly (approx. 800m). The track runs through the competition area. All forest areas to either side of the track are out of bounds to competitors, except for an area around assembly. There is a marshalled crossing point on the track near the entrance runners have priority at this crossing. If asked to park at far end of track you will pass assembly and people returning from finish. Please drive with great care. Registration 9.45-am to 12pm. Collect you backup cards and brikkes, white and yellow maps. Starts 10.30am – 1pm. Start times should be available on Oentries midweek prior to the event. Entries via Oentries. Closing date 26th April 2015. 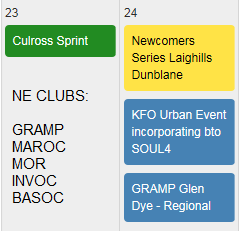 Entries on the day subject to map availability (non-league). Please see SOL rules page for more information of class eligibility. Competitors take part at their own risk and are responsible for their own safety. Assembly is in a track junction area and will contain event registration, preO registration, download, results, first aid, cake stalls and toilets. There will be an area of forest nearby available for (small) club tents, spectating etc. The ground is rough and uneven. Emit timing will be used – no charge to hire a brikke, but lost brikkes will be charged at £40. Brikkes and backup cards with each competitor’s name and start number should be collected from registration. Please insert correct card firmly into your brikkes, or ask if you have any problems. One start for all courses, 400 m, flat but rather boggy, walk from assembly, with Pre-O on way. There will be two finishes, both close to assembly. Courses as per SOL rules. Apologies, but we are unable to offer a string course. Some longer courses will cross roads, consequently no runners aged under 16 on day of event may run short brown, brown, or black courses (British Orienteering 2014 rules 14.21 & 14.22). SHADOWING – parents are reminded they should declare if they are actually helping a junior competitor as opposed to following. Assisted juniors are competitive in their colour course (e.g. White) but not in age class (e.g. W10B). If you are the ‘shadower’ then you must have completed your own race before undertaking any shadowing. COURSE NOTES – On all courses, except Short Green, Green and Short Blue, there is a compulsory crossing of the track used to access the car parking. The only traffic on this track will be orienteers’ vehicles. This crossing point will be marshalled and runners will be given priority. The three longest courses, Black, Brown and Short Brown, cross a minor public road. These crossings will not be marshalled and care should be exercised by competitors on these courses. There are no road crossings on the other courses. Competitors are not allowed to run along the roads or along the car parking track. White and Yellow Courses: There are few prominent paths in the forest, so the linear features followed by the White and Yellow courses are mainly rides. These are not very clear in places and can be confused with more recent vehicle ruts. Rides will be marked with red and white tape where not distinct. White and yellow “smiley faces” and “frowning faces” will be used to confirm correct route choices where there is a risk of confusion. Examples will be on display at registration. Parents please ensure that children on these courses are aware. All competitors must report to download, whether or not they have completed the course. Blank maps will be on display at assembly and in start boxes. Maps for all courses are at 1:10,000 scale. The map has been revised, for significant changes, in March-April 2015 for this event, including extensive revision of the vegetation mapping. In some areas the vegetation boundaries are indistinct and the density of trees very variable. Vegetation boundaries, unless shown as “distinct vegetation boundary” should not be relied on for detailed navigation. In areas of open mature pine forest an understorey of scattered small spruce trees is growing up. Patches of small spruce trees are only mapped where likely to significantly impede progress. Extensive areas of windblow are shown as dark green. Areas of dense bracken are not shown on the map since, at this time of year, the dead bracken does not impede runnability. We are pleased to offer some Trail-O style controls between assembly and start. Entry is free and optional, but please remember to allow extra time on way to start. Competitors must wear clothing that fully covers their torso and legs (British Orienteering 2014 rule 10.1, 14.12). Cagoules may be made compulsory if weather is particularly bad. It is recommended that competitors also carry a whistle. 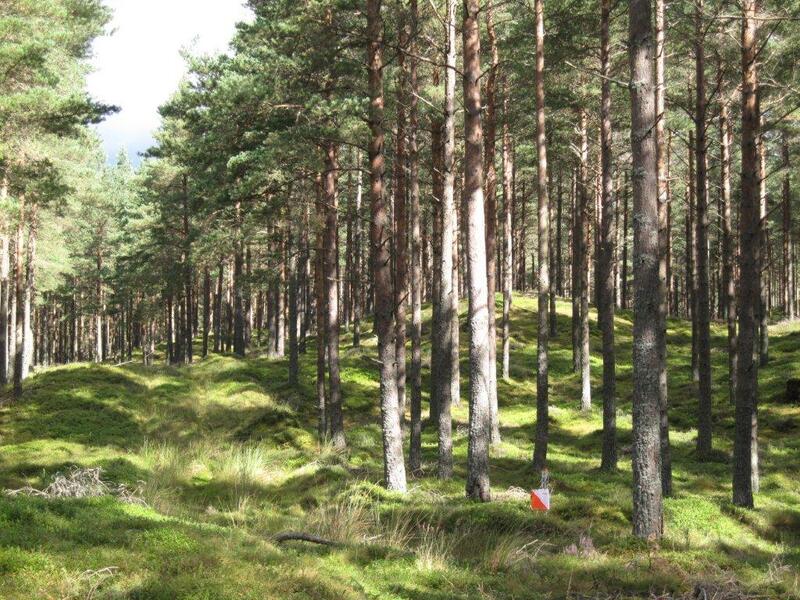 Glen Dye has had problems with Larch tree infections in the past. We do not want to risk introducing any new infections or risk spreading anything from Glen Dye to other areas by transferring spores around. BEFORE EVENT: All clothing and especially FOOTWARE must be clean and free from mud or vegetation debris from other areas. AFTER EVENT: Thoroughly clean and dry all clothing and FOOTWARE before using elsewhere. Glen Dye has ticks. Please check yourselves carefully after the event and remove any ticks promptly. More information here. The British Red Cross is providing first aid cover for the event. They will be located in the assembly area. Also there will be a donation box for contributions to the Nepal Disaster Emergency Committee fundraising and the Langs will match the money made from the cakes etc and add it to the DEC fundraising pot, so the more cake and lemonade consumed the more we will raise for DEC/Nepal. Look out for the stalls somewhere near download and come and get fueled up after your run! Many thanks to Fasque and Glen Dye Estates for permission to use the area. Must be kept under close control at all times. Lambing fields border the forest and it is imperative that the animals are not disturbed. Portaloos near assembly. Nearest public toilets in Banchory. In line with the recommendation in the British Orienteering Child Welfare Policy and Procedures, any person wishing to take video, zoom or close range photography should register their details with the organiser before carrying out any such photography. The organisers reserve the right to decline entry to any person unable to meet or abide by the organiser’s conditions. In the event of cancellation of the event for whatever reason, the organisers reserve the right to retain all or part of entry fees paid to cover expenses incurred or committed up to the point of cancellation.